One of the most valuable and important tools you MUST use at your fundraising auction event is a simple Bid Card. The perfect Bid Card measures 5.5″ x 8.5″ and has a 3-digit BIDDER NUMBER printed (preferably on heavy stock) in 300 point font, black on white background. 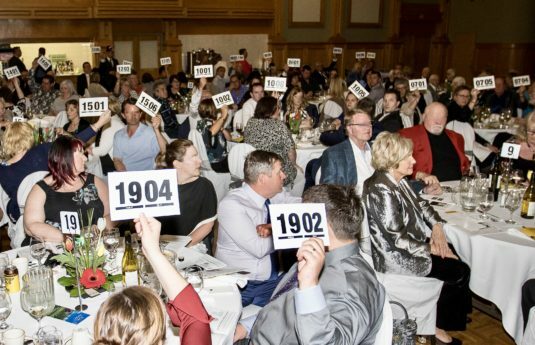 The size of the font is critical – the auctioneer must be able to read the numbers from across the room. Why is the Bid Card with BIDDER NUMBER so important? Because it allows you to easily track the purchases of the attendees at your event. Upon registration, each guest is handed their Bid Card and will use their BIDDER NUMBER in the Silent Auction, Live Auction, to buy raffle tickets, etc. And if you’re having a Cash Appeal (aka Fund-an-Item, Fund-a-Need, Paddle Raise), you’ll REALLY be thankful for the Bid Cards, as they enable your volunteers to quickly and accurately record each pledge that is made by your guests. Cash Appeals can generate a LOT of money very quickly. It is essential that you’re well-prepared to capture every donation, and the easiest way to do that is by using Bid Cards and a Cash Appeal Recording Form. You can download a sample of one after you watch the following short video.